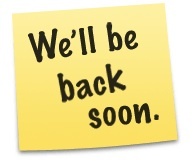 We’re offline for “maintenance” until August 2nd with no way to receive emails or respond to your requests and orders. We mention this so that you know why you won’t hear from us until then. We haven’t forgotten about you, we’ve just remembered about ourselves. So please be patient while we’re recharging.